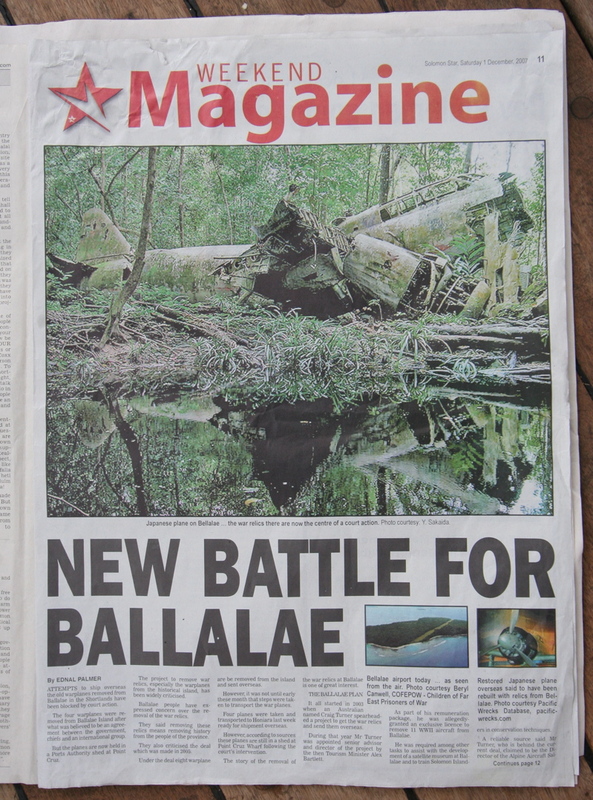 Ian Townsend: Ballalae (BAL-uh-lye), and it’s one of the most remarkable warplane graveyards left in the Pacific. Lately though, Ballalae has become a battleground between warbird salvagers and the people who want to see the last of these warplanes left where they are. Ballalae is in the Solomons, in the Shortland Islands group near the border with Papua New Guinea. At the end of the war, the Japanese fled this island. The surviving British prisoners who’d built its airstrip were executed. Hundreds of them. The Japanese left behind almost everything: guns, beer bottles, bodies, and warplanes. For decades it’s remained largely untouched. In November last year, an American who’s been recording the island’s many plane wrecks happened to arrive just as the wrecks were being loaded onto a boat. Justin Taylan had arrived by yacht with three friends and started filming. But he was arrested by the Solomons police. The day before he was tried for illegally entering the country, I spoke to Justin Taylan. He’s speaking to me by mobile phone from the yacht off the town of Gizo in the Solomons. Justin Taylan: Well Ballalae Island is a location that doesn’t just captivate myself and my colleagues who are studying the history, and trying to document the physical remains of the war that remain there, it’s also caught the attention of many people who hope to remove the airplane wrecks from the islands and sell them. And specifically, during our visit to the island in November, we had the unfortunate timing of arriving precisely when an Australian salvager was there to collect the relics that he had moved close to the shore previously, and export them overseas. I should add that according to him this project was done in co-ordination with Solomon Island National Museum and the terms of that agreement are not publicly known, and as soon as we observed this salvage, we were immediately taken into custody by the police and held without charges for 18 days, our passports confiscated and even the film footage and video that we had shot on the island was confiscated from us. No charges were filed and it became very obvious to my friends and I that we had observed something that we were not supposed to see and something that obviously the people involved wanted to make sure the rest of the world didn’t know about. Ian Townsend: Justin Taylan was convicted of illegally entering the country the day after I spoke to him. He and his friends had faced three years jail, but instead they were fined. 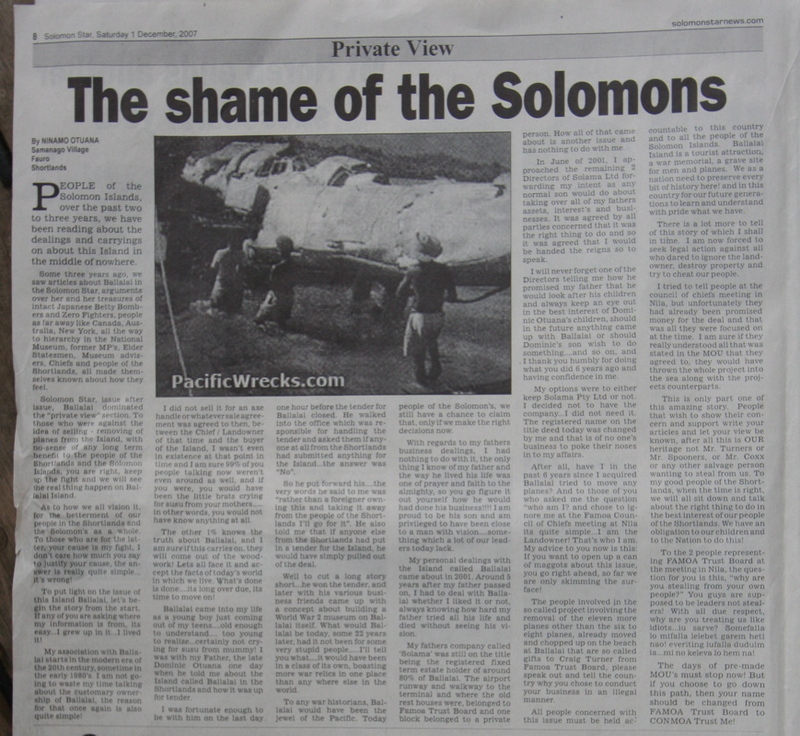 This is a big story for the people of the Solomons. Tourism is the major industry and increasingly, tourists want to see war wrecks. Background Briefing understands that some warplanes salvaged from Ballalae were to be sent to a warbird collector in the UK. The salvaging of these wrecks is causing a lot of anxiety. The previous Solomons Government apparently struck a deal last November with local chiefs to export every warplane wreck in the Shortland Islands group. 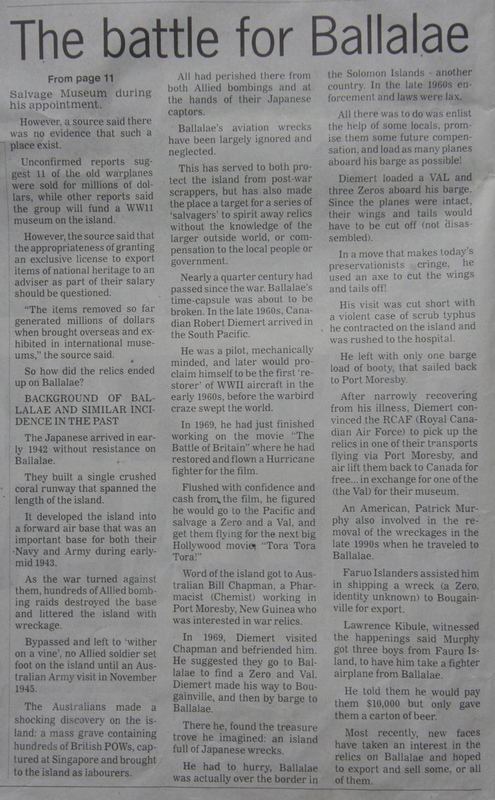 It agreed to pay chiefs from a group of islands known as FAMOA 50,000 Solomon Island dollars for the wrecks. That’s about 7-thousand Australian dollars. Many locals are very unhappy with the deal, and a Solomon Islands television station called One News sent a reporter to the Shortland Islands to investigate. Newsreader: Two weeks ago, with the approval of government, the chiefs of FAMOA were paid 50,000 dollars and signed off on a deal with an overseas buyer to sell their relics overseas. Owen Taylor with more. Man: We believe that there are a lot of people behind this deal, people that we don’t know about, people that we’ve never seen before, we’d never meet. There’s a lot of money changing hands. We as chiefs don’t even know when we’re going to get our bit that they’ve promised out of $US220,000 to move 11 planes, priceless and both worthless. Priceless in the form of history and important coming in of tourists to see it. And worthless at the same time, it’s just a piece of metal. But the pricelessness to us is it’s our treasure as well. Ian Townsend: That report is from the television station One News in the Solomon Islands.